Okay, so let me just preface this by saying that I think players who play in face masks are seriously badass. Not just because the masks make them look tougher, but because they are obviously wearing them due to having broken a bone. In their face. That is not even healed yet. I’ve broken enough bones in my body to know that between the pain of the injury, the pain of the healing process, and the discomfort of wearing any kind of brace, let alone on your face, these players are badass. And thus, I dubbed the badass Novara keeper, Ujkani, the Phantom of Novara. Of course, the Phantom was tormented by the relentless Milan defense, especially in the first half. They pounded at goal like a jackhammer, with at least 14 shots in the first half alone. With one or more shots from Ibra, van Bommel, Robinho, Silva, Nocerino, Mexes, and Antonini, there was no rest for the Phantom at all. There were many impressive shots, Ibra’s free kicks, Nocerino’s shot in the 33rd that just glanced the outside of the post, Silva’s header from point blank range, van Bommel’s rocket launched in the 16th that went just wide. But between that badass keeper in goal for Novara and our not-quite-finished finishing, it looked like another frustrating one for Milan. One problem was that Ibra does not have the same faith in Urby as Allegri does, so he kept dropping back very deep to get the ball forward, and then had to rely on Robinho to finish. Giuseppe Mascara started for Novara today, a player who is lethal in both attack and looks. 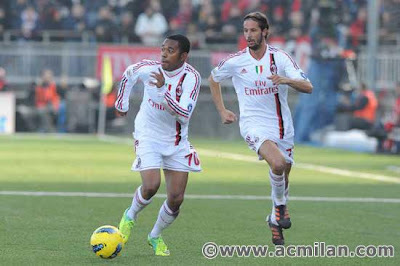 Only today, the biggest mark he made on the match was to earn the first yellow for protesting after fouling Ambrosini. Better luck next time. Also of note in the first half, striker Caracciolo was the Phantom’s BFF, making several key goal line clearances that kept the match scoreless. I don’t know if it was the facial hair or what, but Antonini had a fabulous first half. He was the first to make me wonder if the synthetic pitch also had synthetic mud, he had been getting dirty right away. I saw some stats at the half that said he had the most completed passes, the most tackles, etc. of anyone on the pitch in the first 45 minutes. So why he was made the sacrificial lamb to bring on Shaarawy, I will never know. Emanuelson, who had not been effective in the first half, was moved back to the left back spot. Many of you know that I love Urby. Especially for his versatility. He has had some good games where I felt he did not get the kudos he deserved, yes, even at the trequartista role. So many people want him to play at left back, as they feel he is better there. I disagree. Watch what happens to our back line when he is on. It is stretched to a 3 man back line. And he is not always effective offensively, either. Honestly, Allegri, versatility is his strength, but not a requirement. Just because you can move him to left back from the midfield does not mean you have to. Enter il Faraone. With Ibra up front and Robinho dropping back, Il Faraone had an immediate impact on the attack, and the poor Phantom looked doomed. Sure, we gave Novara a few more chances, like Caracciolo’s in the 47th that Amelia just got a hand on. But in the 57th, Ibra broke the plane of the goal with a beautiful assist by Captain Ambrosini. 0-1 Milan.There were many shots, like El Shaarawy’s in the 72 where he dribbled around the keeper, but it ended up just wide. And then, just 2 minutes later, he assisted for Robinho, who actually finished a point blank goal instead of sending it into orbit. 0-2 Milan. (This despite a Nocerino handball that was not called leading up to the goal.) And in the 90th minute, with the cheekiest of backheels, Ibra beat the phantom for his 2nd on the night. 0-3 Milan. Coming straight from the half, I noticed that all Novara players were eager to get a piece of Ibra. It was as if Tesser had told them it didn’t matter how many players were on the pitch at the end of the match, they must take down Ibra. Which gave me an idea: Given our severe injury crisis, wouldn’t it be prudent to wrap all of the players in bubble wrap? Just an idea. For a little team, they sure put up a fight. Anyway, as is often the case with a team like Novara, the yellow cards began to fly in the 2nd half. Just to review: Pesce, 55th; Marianini, 70th; Ujkani, 75th; and just to be fair, Ambrosini got one in the 78th. So sporting of him. In the 80th, it seemed as though Tesser might get his wish as a collision caused Ibra to roll his ankle. But the tough Swede got up and 10 minutes later made them pay with his 2nd goal. Allegri did his “absent-minded” subbing, as in “I forgot to use my subs, so I will use the other 2 in the last 3 minutes.” Merkel came on for Robinho in the 87th, and Seedorf was almost insultingly subbed on in the 91st for Ambrosini. But despite getting a lot more looks on goal (meaning Amelia wasn’t so bored) and more possession in the second half, Novara were no match for Milan on this day. Milan had 24 shots, 9 on goal, and Novara apparently got 10 shots off, but only 2 on goal. Add in 62% possession, and dominant is the word that comes to mind. A few question marks for me. One, where was Mesbah? The one actual purchase we make and we don’t get to see him, even for a few minutes? I’ll be curious as to how Allegri uses him. Secondly, and more importantly, do you think El Shaarawy and Hamsik share the same hair stylist? In all seriousness, tomorrow night, at the Oscar del Calcio awards, El Shaarawy will collect the award for the best player in Serie B last year. I am so not into hype, but now that he is finally been given some playing time, I would expect he might be collecting the award for best young player in Serie A next year. Ibra may dominate, but it's not a walk in the park. Ibra’s goals tonight gave him 108 goals all time in Serie A in 203 matches. That is some serious goal action. He has also reached the distinction of scoring against 29 different teams in Serie A. He may be collecting some awards tomorrow night, too. As well as the collective teeth-chattering of all of our opponents. Yes, we won against the little team today. Which was important. Our opponents will say that it was easy. But we were missing 10 players today, and are the only team in Serie A to have a player miss most of the season because of heart surgery and another one because of a rare eye nerve problem. If we can keep this up, we deserve the Scudetto, as we literally have the heart of a champion amongst us. And while Novara’s attack was virtually a phantom today, their masked keeper made our job very difficult. We should be proud of our boys and celebrate this victory as we go into the often less than dramatic opera that is the Coppa Italia quarterfinals on Thursday.